life was about to begin - real life. to see there is no way to happiness. remember that time waits for no one." As someone who shoots photos I spend most of my time behind the camera. And as someone who knows professional photogs, I know they don't have time to shoot me. However, it would be nice to have a pic or 2 to prove to the world (and myself) that I exist. So this past Saturday I decided to try something I've previously failed at miserably: self-portraits. After 2 hours (more like one, but it felt like 2) of fighting with my settings and my tripod and taking close to 80 pics I was able to pull these 3 from the pile. I borrowed the display format from my friend and photog mentor (most of you know who). Out of respect for his social media space I will simply credit him here anonymously. In this instant age of instant everything we want it now and we wish we had had it yesterday. We don't even take the time to read past the first few sentences if the answer we seek isn't at the top of the page. We go back to our Google search page and look for the next "better" result while completely overlooking what might have been contained in Paragraph 2. Fear is faith in bad things. Once you become fearful you begin to mentally invest in the outcome of failure and defeat. Fear is the mind-killer. It will paralyze you and have you acting crazy. It will prevent you from realizing the full person, parent and spouse you were designed to be. "Act as if you are" and "act as if it is" and what you seek will eventually come to you despite whatever obstacles may present themselves. Fear can only be overcome head-on. It is easier to face your fears when you have someone in your corner, cheering you on, keeping you on task...keeping you in line. I hope that you will consider adding at least one to your personal library. A little personal investment goes a long, long way. I love my husband. He is the most caring, loving man I have ever met. I have a hard time leaving him, even if it is just for a weekend. We are excepting our second baby (I'm due in September!). I don't have to beg for him to take the trash out, he works everyday, he loves me fiercely. It all sounds good, right? My husband is 15 years older than me. Some say I got myself another daddy. One thing I do know is my husband loves me. He works 50-60 hours a week to make sure he provides for his family. Since I have not been in the workforce in what seems like forever, I'm not very understanding when it comes to needing my time. I used to expect him to work 10 hours a day and then still come home and do everything I had on my to-do list for him. I was tired of him not listening to me about our money problems. I was tired of him not listening about my schoolwork. I felt like he was ignoring me. I'm the one at home cooking, cleaning, and taking care of his kids. He was raised in a household where his grandfather worked outside of the home and his grandmother was at home. My hubby wanted the same for me. I decided to stay at home for him. I felt the least he could do was listen to me when I had something to say. It wasn't until our son brought it to my attention that there was a problem. I realized that my husband was not the problem. It was me. I complained about how he worked too much, did not take enough time out for the kids, how we didn't have any money, but I never told him thank you. I know going to work at 5 am and not getting off until 5 pm is not easy. I never said thank you for all you do for this family. I was taking him for granted. What do I do differently now? I get up from whatever I am doing to greet him when he gets off work. I ask him when he gets home if he would like his plate now. give him 45 minutes to an hour to relax after a long day. I keep the kids out of his way as well. I am sure to ask him about his day. If he says he is tired, I know it was a long day. If he says it was okay, it's okay to ask him to do what I need him to do. We have a weekly family meeting--this is my time to let it all out! Sometimes you are the problem. You have to take control to change what you don't like. He is my husband and I want this to work. I changed what wasn't working into something that worked. Taking a page from my blogger buddy, MyBrownBaby, I am yet again changing the name of my Twitter Chat party to #DadsThatDo. Here on this blog I promote and encourage Dads To Do --- more and better for their families and themselves. My goal with this ongoing chat is to highlight and showcase the guys that are doing right by their families rather than spend time discussing those who choose not to. Besides, why give people who don't matter a platform they don't even deserve? This week we'll be discussing a subject that got considerable traction as a static post: Facing and Overcoming Fear - especially those pesky parental fears. I'm going to get the conversation going with a series of questions that will inspire dialog, personal reflection and some tools to overcome fear. Of course this chat is open to Moms too. In fact it's open to everyone so even if you aren't a parent, husband, wife, etc., please drop in. Please help me SPREAD THE WORD. Click here. 1. Have a Twitter account. 3. At 9pm EST/6pm PST join here at Tweet Grid: http://bit.ly/qybwzK Once you are in add your name to the Grid (column) on the right. 4. hashtag: #DadsThatDo - if you don't join us via TweetGrid.com, you can use TweetChat.com. If you are simply tweeting along make sure to put #DadsThatDo at the end of your tweets so we can all see what you've got to say. 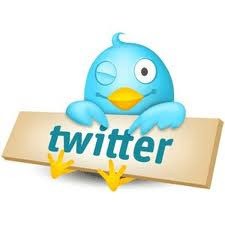 (if you use either TweetGrid or TweetChat the hashtag is automatically inserted for you). 5. Click here to SPREAD THE WORD. E.Payne is the author of DAD: As Easy As A, B, C! : 26 Dos & Don'ts For Fathers and 2 other books. For the past 3 years he has posted 700+ articles about fatherhood, marriage and everything in between here at Makes Me Wanna Holler.com. To learn more, click here. To learn more visit the website of documentary filmmaker, Janks Morton. Eric Payne © 2011. All Rights Reserved. 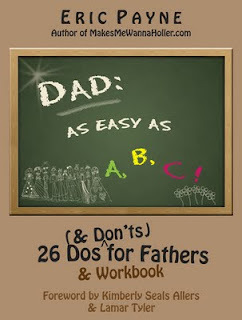 I'm giving away 25 copies of my new book DAD: As Easy As A, B, C - 26 Dos & Don'ts for Fathers. It is the easiest giveaway on the planet. If you haven't already, please Like DAD: As Easy As A, B, C by Eric Payne on Facebook. Click on the CONTEST STATUS HERE and simply Like it. The 1st 25 people to Like the above status will receive a free PDF version of the book (contestants must have a valid email address (a Facebook email address will not work). I want to take a break from the reality of life and have you all take a one minute and forty-five second plunge back into childhood where superheroes did exist and overcoming all odds (especially those from within) was an actual possibility. We all know dads wouldn't be DAD without MOM. That means we are either in relationship - married or unmarried or were in relationship - formerly married or things just didn't work out with the girlfriend (or worse). We ran out of time at our last Twitter party since our July 19th #DadsDoChat will pick up where we left off discussing relationships between DAD and the woman/women and family people he loves. 3. At 9pm EST/6pm PST join here at Tweet Grid: http://bit.ly/oRibGa Once you are in add your name to the Grid (column) on the right. 4. hashtag: #DadsDoChat - if you don't join us via TweetGrid.com or TweetChat.com put #DADSDoChat at the end of your tweets so we can all see what you've got to say. (if you use either TweetGrid or TweetChat the hashtag is automatically inserted for you). 5. I'll be giving away two (2) eBook versions of my new book DAD: As Easy As A, B, C! 26 Do's & Don'ts For Fathers to two (2) lucky participants. 6. Click here to SPREAD THE WORD. 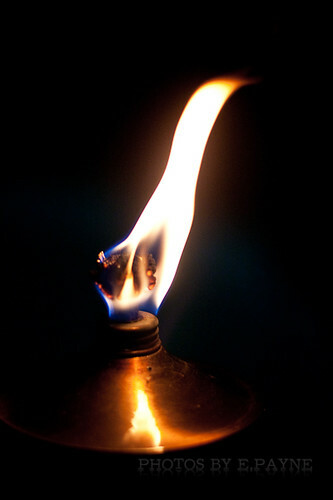 Sometimes the darkness causes you to do a beautiful thing: Light A Fire. I was concerned before I went to go see this film. Concerned that despite my love for cartoons it would be too infantile for me or my daughter. But once the movie began I realized there was pure beauty in the simplicity of this tale of a child's imagination run wild. This, of course, was balanced by Eeyore's extreme realism, which provided the bulk of the adult humor in the film. This reincarnation of Winnie The Pooh took me back to my own childhood where I romped around through the playthings of my daydreams. My daughter's face was aglow with happiness as she sat captivated by the mix of animation, words and imagination. It helped me understand her sudden attachment to her new friend, a bunny she named Beyonce (don't get me started). Winnie the Pooh opens nationwide in theaters this week on July 15. It will definitely be time well spent with the kids. 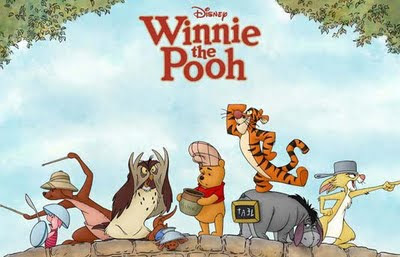 Disclosure: I saw the advanced screening of Winnie the Pooh courtesy of Klout Perks. This week's #DadsDoChat (I changed the name from #DadBookAbcChat) is all about relationships with the women that make us happy and/or drive us crazy. I'm going to be asking a few pointed questions about life when it comes to love that will definitely get the conversation going. I heart Adele...tremendously. She's pure, raw, unfiltered and stays out of the limelight. On the evening of July 7th she performed at the iTunes Festival in London. Here's a clip featuring her hit: Rolling in the Deep. Even babies do it. But they don't stink when they do it. Thank God! What am I talking about? I'm talking about sweating. If you work out like I do, if you have a pulse as most of us do, if you work with your hands or if you just happen to be suffering through this summer heat wave funk --- the stink that comes from sweating --- is inevitable. Each and every morning we all reach for our deodorant or antiperspirant to help cover up that inevitable funk. But why cover it up? Why not just neutralize it at its source? 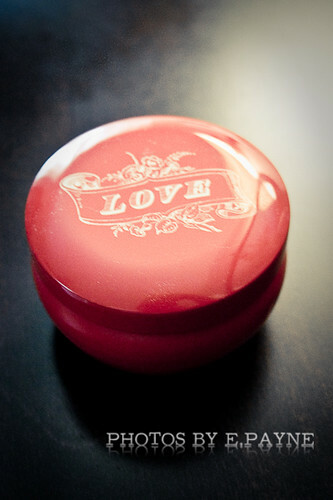 Base fragrance delivers an initial burst of odor protection during application. Odor Shield Technology targets and neutralizes body odor at the source. Scent Enhancing Technology (SET) works to deliver a long-lasting scent. To learn more and enter to win a nice prize pack join yours truly and a bunch of other good folks for the Gillette #OdorShield Twitter Party today at 4pm EST. Read below for all the details. Anyone who Tweets this (http://clicktotweet.com/2rKUJ) from now until the Gillette #OdorShield Twitter Party will be eligible to win one of four $50 Amazon gift codes and Gillette Odor Shield Prize Packs! I happy to announce that Brian L. Thompson is the Winner of the $45 Outback Steakhouse Dinner With Dad Experience! Brian, you have 24 hours to claim your prize by emailing me your mailing address via the Contact Page located at the top of this page. Congratulations, Brian and congratulations to all who participated! Twitter Chat #2: Do Good Dads Deserve A Pat on The Back? "You're a good dad...so what? You want a cookie?" "You think you're some super father or something...all hail the king...but all you're doing is what you're supposed to be doing?" "Whoop-tee-do..you don't do anymore on any given day of the than any mother does day in and day out." If you're a father who is any good at what he does, whether you advertise it or not, there's probably a 100% chance you've heard one of the above from someone, and more than likely someone close, such as your wife or if unmarried, your child's mother. Do Good Dads Deserve a Pat on the Back? Do Good Dads Need A Pat on the Back? To locate us search the twitter hashtag: #DADBookABCChat and if you don't join us via TweetGrid put #DADBookAbcChat at the end of your tweets so we can all see what you've got to say. I'll be giving away two (2) PDF versions of my new book DAD: As Easy As A, B, C! to two (2) lucky participants tonight. For my readers here in America and to all US citizens and troops abroad...from my family to yours, I hope you are having a safe and happy Fourth of July Weekend! I've been bad. 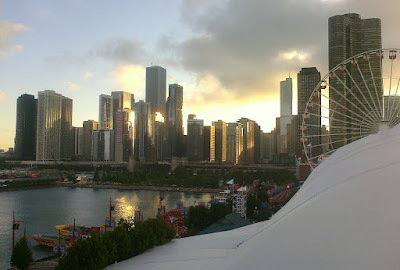 I've been neglecting the blog. Last week, I told you all I would post a few things this week. But I only managed to post about my newest book on fatherhood. Besides my own personal war to stay positive and faithful and strong for my family in the face of our currently financial crisis. I released the book and was fortunate to be interviewed on an internet radio show. but, my daughter took ill in the midst of all this to the point of wheezing and being short of breath. As an allergy sufferer who has experienced bronchitis and allergy induced asthma attacks, I take not being able to breathe personally. I take a child not being able to breathe as being some sinister curse from the powers of evil. My child not being able to breathe...let's just say I wasn't the most pleasant person to be around while we got her all fixed up. Plus, the fiasco that was her initial doctor's visit was...well a fiasco. The story will have to be put in queue behind my Father's Day Fiasco. Now my little one is all fixed up and a day later her brother high tailed it out of the ATL for our native New York to spend the rest of the summer with his grandpa. But he isn't going to party (only), he's got a job there. So there was a whole lot of last minute running around for working papers, physicals and the like bhttp://www.blogger.com/img/blank.gifecause why on Earth would a teen be concerned enough about themselves to make sure their ducks are all lined up? But he's a teen and I understand this. Not to mention my car is in the shop and I'm almost scared to find out what's wrong with it. In an effort to provide myself with some therapy I went to see Transformers: Dark Side of The Moon...AWESOME! I also treated myself and the family to some well deserved Chinese food. Then propped myself up at a Mashable Meetup event and did my best to network when all I wanted to do is sleep --- something I haven't been doing. Point is, this was a week that required me to shift gears repeatedly to get the job done. And the one thing that will always suffer when I've got real stuff to do is...this blog. But in looking at this blog, the content is current and relevant but it is need of some dire maintenance. Thank God it's the 4th of July weekend and hopefully all of you will be outside enjoying your families, or at least some good food and drink. 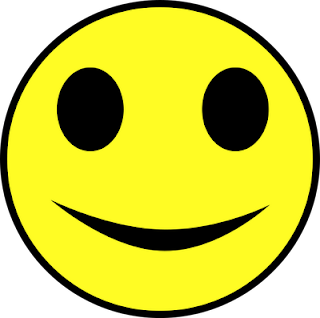 Hopefully next Tuesday or Wednesday when you all return to your desktops and laptops you'll notice some very subtle, but very necessary changes here and on the social networking sites that have evolved from here. 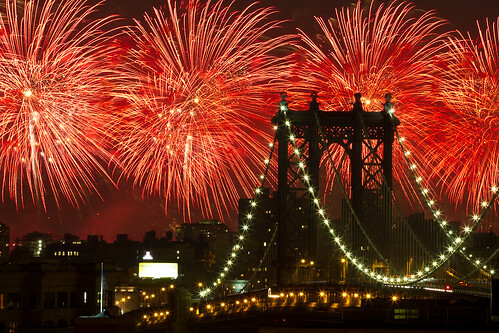 Have a wonderful, safe and Happy Fourth!